still pleased if visitors emulate the good saint by parting with some of their worldly goods too. the death of St. Francis, one of Italy's principal patron saints. On our tour we heard that he lived a simple life of poverty. Back in America. 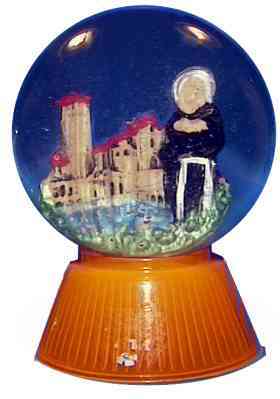 I did some reading and learned he founded the Franciscan order, and was a social worker and lover of nature. He attained sainthood because he was said to have acquired the stigmata of Christ on his palms and ankles after a vision. I learned that changing money in Italy on a Sunday is sinful. They punish you with a horrendous exchange rate, but I needed some lira to buy snowdomes.I lost 20% on the transaction, but it did allow me to buy the domes above. round balls. 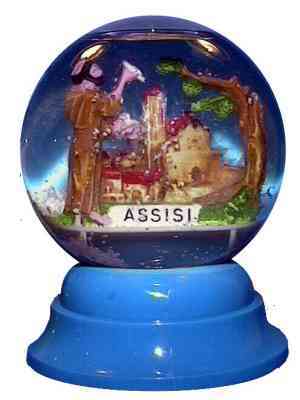 I tried to ask (in Italian) a little old lady running a giftstand what snowdomes were called in Italy...She called them Bollonaires de Neve. ...or balls with snow? 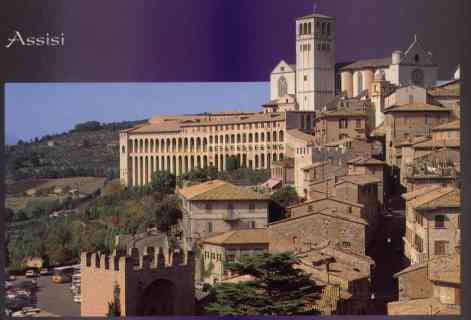 To tell the truth, Assisi is a wonderful town and you certainly must visit and ramble through its winding and hilly streets.. .